Today i got my limited edition drew album, "the floor is made of lava". It's very cool. I don't think you can buy it any more, but you can download some of the songs from this page. I suggest you start with "perfect day", which is my favourite. The next generation of Yahoo IM pron spam is getting 'better' at tricking users. It first sends you a "hello" message, then waits for a reply before sending you pron urls. Very clever, if not completely immoral. 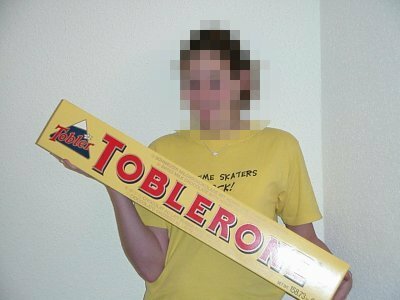 I bought the world's biggest bar of tobelerone. It's 4.5kg (10lbs). Now that's what i call a snack. Headline of the month: Why did you steal 40,000 hotel coat hangers, knowing that hotel coat hangers are designed to be useless outside hotel wardrobes? I found a really handy guide to customising your bash prompt. A very interesting map of dialects in the US. Why is it that really powerful servers always look much sexier than less powerful ones. maybe it's a geek thing.